Posted by Null in Entertainment, Music, News. Jacko’s Doc is found guilty and goes to jail. Maybe he was the culprit or maybe he was just a normal guy who became a victim. But the moral of the story is: “Don’t ever mix up with celebrities because they will destroy your life while they are killing themselves”. Why do they do it? Why do they abuse everything? Posted by Null in Expression, News, Sports. I have always realized that the format of cricket is ever changing and more and more fans are joining cricket these days. This change is inevitable as because of the demand of the new generation. However, I won’t make any proletarian judgments about the future fate of Test cricket and 50 over matches. Those longer formats of the game are the real game because the chances of a weaker opponent to win with a major opponent are very less. But as we are going through the new format of the game, we have already observed that in T20 format, it can be anybody’s game. In the T20 World Cup 2007, Bangladesh made a major upset beating a top team West Indies and Zimbabwe beat the mighty Australia. This year, the less known rookie Netherlands took the nerve to beat England in the very first game of the T20 world cup 2009, unfortunately at the England’s best boosted Lords venue. Would we call these upsets? I guess not. I reckon there are no minnows in T20 format. You play the right shots, you take risks, and if you are a hard-hitter who can play all shots in the book, it’s gonna be your game. Like I said before T20 is anybody’s game, but you gotta have nerves and talent to win with a major team. I also expect that more newer teams should be included in the T20 format to make the Cricket promote to a more wider sports community around the globe. This does not actually mean that star teams will loose with minnows every now and then in 20-20 format. Star teams will always remain top teams as long as their strategy, nerves, talent and experience is there. But they need to be a little more cautious in this format of the game. Posted by Null in Business, News. The US automobile giant GM which was founded in 1908 have just filed bankruptcy. This is definitely a tragic end to a very old business giant. GM brands includes Chevrolet, Hummer, Pontiac, GMC, Cadillac, Holden, Saab, Vauxhall, Opel, Buick, etc. The company fell into a liquidity crisis during the global economic recession and asked for financial assistance from the US federal government. Today, the US President Obama has said on his speech that GM is a very complex organization with worldwide operations and it would be a reluctant investment on the company not just because it employs many workers but also carries an American pride and provided economic contribution to the US. The governement will provide $30 million after the bankruptcy. GM’s operation in other parts of the world will somehow survive (God knows how). For example, the Canadian government will support the GM Canada; the Australian government will support the GM Holden with financial loans. But I am just wondering, who’s gonna convience the general consumers to purchase a GM auto since the company is bankrupt! As part of the bankruptcy, more 14 plants in the US will shutdown and the company will cut off approximately 21,000 jobs and axe 42% of its dealers. Posted by Null in Australia, Ethics, News. It’s too un-Australian to bash Indian students just because they don’t have the color or because they can’t speak in an Australian accent. Very recently, I was going through newspaper articles about some of the incidents that happened with international students..which shocked me. I am also shocked that the authorities are silent with this issue. The international students come to this country, they study, pay their tuition fees, pay taxes, and eventually gets a knock from the local Samoan thugs. I am not outrageous about general Australians but we do face many social realities as new citizens or migrants which we never spoke about even though some of those realities are worth mentioning to others. Last month I went to Amsterdam and a local guy asked me whether Australians are too racist or not because they read and hear lots of incidental stories. I really felt a shame that time. We choose this country because we love this country, it’s weather, liberal lifestyle and multiculturalism. What I believe is Australia is a land of beauty where all citizens regardless of race, color & ethnicity should live with harmony. We should learn how to be tolerant to cultural diversity. These days, things have changed. Australia is now no longer a nation like it was when there was a “White Australia Policy“. In those days, the country’s legitimate owners (Aborigines) were being deprived of their rights other than some benefits. Then there was the infamous Pauline Hanson and some others. Pauline is neither the immigration minister nor she has the right to speak racist comments since her ancestors were migrants. Lucky Pauline, she was not raised in a different country; otherwise who would have led this low minded and prejudiced one nation party! I reckon these racial tensions have escalated just because of two reasons. 1) There are some people like the racist and fraud Pauline Hanson who tries to influence the general population; 2) The government or the state is unaware how to handle a multicultural society (try learning from US or UK). From my little knowledge about the history of Australia, the country can no longer be labeled as a racist country since racism exist more or less everywhere on earth. But the silence from the government authorities in mob attacks represents a lenient approach to diversity. Bruce Haigh’s article can provide more insights about the Rudd government’s governing methodology. If the authorities and the law enforcement bodies do not take necessary actions or steps to eradicate these tensions, it will escalate to a serious peak which may lead towards a low profile Australian image to the world. Tourism, trade realtions, people perception and off course revenue earnings from higher education will be in jeopardy. Posted by Null in News. What happened to be the most bizzare story today is Al Gore’s “Live Earth” climate campaign could be at stake when his son was being arrested for possessing eco friendly green marijuana. His son Albert Gore was arrested by the Orange County Sherrifs Department on 4th of July. While the dad is educating people about the greenhouse effects, the son goes more green with leaves of marijuana and other illegal drugs such as valium and xantax. Like dad, like son. Some argue that Al Gore himself had taken marijuana before. I reckon Al Gore should start educating his family before campaigning to others. Charity begins at home Gore, go educate yourself and your family first. Posted by Null in Australia, News. 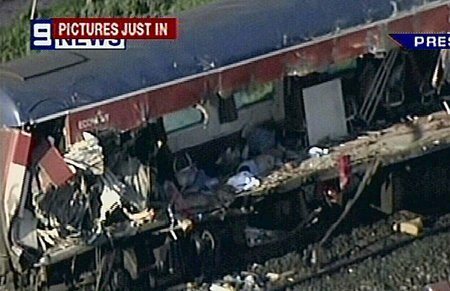 Its a sad situation in Victoria where a truck hits a car of a V/Line train in Kerang, Victoria. Death tolls have not been totalled yet but it might reach to twenty or more. The crash is considered to be the state’s worst disaster in couple of decades. I reckon the time has now come for the government to clarify what’s going on with the bloody rail services. Why are we the taxpayers, paying so much money for travelling with such inferior quality train safety and staffs? Aren’t we being cheated by the rail system? Read the whole story and updates in Sydney Morning Herald. 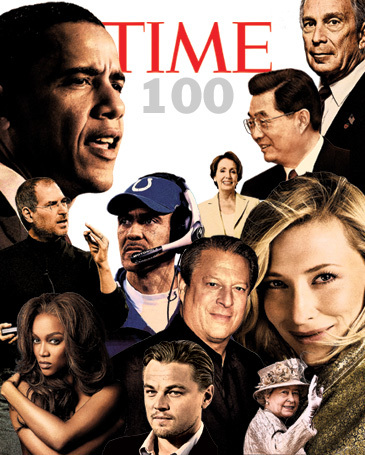 A little while ago, TIME Magazine unveiled the 100 people who shaped our world in 2006. The list includes musicians, politicians, comedians, writers, movie stars, entertainers and so on. This year’s list has 71 men and 29 women from 27 different countries. But guess what, the most influential Mr. Bush who was once the TIME’s person of the year didn’t make it in the the 100s even this year. Pity on him. However, to me it felt like Americanos who shaped our politics, movies and entertainment this year. Most of them does’t seem to me as influential people. Rather Zimbabwe’s Mugabe looks more influential than many of the listed ones. Some of them who got into the TIME 100 of 2006 are Oprah Winfrey, George Clooney, Sacha Baron Cohen (Borat), Brad Pitt, Leonardo DiCaprio, Justin Timberlake, Pope Benedict XVI, Cate Blanchett, Arnold Schwarzenegger, Simon Fuller, John Mayer, Michael J Fox, Angela Merkel (German Chancellor), Kate Moss, Raul Castro (Cuba’s acting president), Queen Elizabeth II, Condoleezza Rice, Sonia Gandhi, Hillary Clinton, Hu Jintao, King Abdullah, Barack Obama, Osama bin Laden, Roger Federer, Thierry Henry, Al Gore, Chris Anderson, Richard Branson, Chad Hurley & Steve Chen (YouTube founders), Katsuaki Watanabe, Lakshmi Mittal, Steve Jobs, Philip Rosedale (Seond life cyperspace), Indra Nooyi (Pepsico’s CEO), an many many more. Gosh… I am so lame to write the whole list. If you feel interested, read all the 100 profiles in TIME’s website.